Time Out Market wants to get off on the right foot with its soon-to-be neighbors in the 1600 block of Drexel Avenue, so it is proposing to reduce the hours of its Miami Beach operation on Friday and Saturday nights. While approved by the Planning and Historic Preservation Boards, area residents and several City Commissioners continued to express concerns about a 2 am closing time on weekends. Rather than engage in a protracted fight, Time Out says it will close at midnight in an effort to prove its concept to the community and show that it will be a good neighbor. 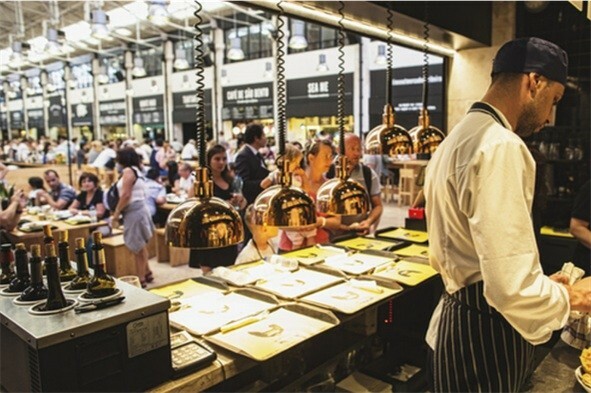 Time Out Market is a high-end food hall where up-and-coming chefs and restaurants can test new concepts before rolling them out. For its South Beach location, it is planning 18 food kiosks with 320 seats at communal tables indoors and 120 outdoor seats on Drexel Avenue, just around the corner from Lincoln Road. The block where the market will be located is zoned for high-intensity commercial use but it is across the street from residential buildings. Throughout the Conditional Use Permit (CUP) process, neighbors characterized the operation as a nightclub due to its application for a liquor license and its plans to have live music on-site. Attorney Monika Entin told the Planning Board last month that alcohol is not Time Out’s primary source of business and emphasized it is a restaurant, not a nightclub. At that time, to help ease concerns, the operators agreed to no live music and no dance floor inside (even though a dance floor is not part of the business model or proposal). This week, Entin filed a request with the Planning Board to modify its CUP with the reduced weekend hours. As approved, the sidewalk café will close at 10 pm Sunday through Thursdays, with indoor operations permitted until 11 pm. Fridays and Saturdays, outdoor seating will end at 11 pm, with the new request to modify the indoor closing time from 2 am to midnight. The Planning Board is expected to consider the request at its May meeting. The market currently has a location in Lisbon and one soon to open in London. According to the company’s website, it aims to “get the best of each city and bring it together under one roof.” It says its’ Lisbon operation has become the number one tourist attraction in the city. Time Out’s Miami Beach location is proposed for a long-vacant ground floor space below a parking garage at 1601 Drexel Avenue. The garage was built in 2012 and the ground floor space has been vacant since.